Sew-On Snaps - DRITZ-Sew-On Snaps. 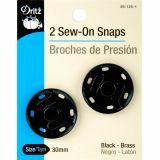 This package contains two sets of 30mm sew-on brass snaps in antique brass, black enamel painted or nickel: each sold separately. Imported.